These fish are native to Southeast Asia and are found in the Mekong River basin. You should provide plenty of hiding spots for this Loach. They will dig up substrate looking for bits of food, so use fine gravel or sand. In their nightly searches for a meal, these fish may uproot plants. Make sure any plants that you have in your aquarium are well rooted or anchored. You must keep excellent water quality for this Loach to stay healthy. It is well advised to only add them to an established aquarium. You should keep this fish with similar sized peaceful fish. They are suited fairly well for a calm community aquarium. Be sure to keep them in groups of four or more. 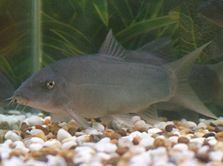 The only noticable sexual difference with this Loach is that the adult females will appear fatter than the adult males. Redtail Botia are very territorial with their own kind. They will form a "pecking order" in their group. Once this order of dominance has been established, they get along with each other peacefully. As juveniles, these fish will school up and shoal. When they reach maturity, this behavior falls off and they become more solitary. They will play dead in the absence of a good hiding spot. Always check for gill movement and let them stay in the aquarium for a couple hours before you remove them as a casualty. The adults will spend daylight hours hiding. They prefer to hide by themselves and not with other Loaches. Make sure that you have plenty of suitable hiding spots where they can sleep away the day. At night these hungry fish come out and scavenge the substrate. They dig for food and will sift through your gravel or sand relentlessly. Sometimes, when eating something that they really like, these Loaches will make happy clicking noises. Redtail Botias are not bred easily in captivity. They are rarely, if ever, seen spawning in the home aquarium. Many of these fish are captured as juveniles in the wild and sold to aquarists. Some may be bred in facilities that use horomone treatment to induce spawning. This is most likely because they are seasonal migratory spawners. For more information, go to Wikipedia's Redtail Botia page.